"Redefining Cost: A Beacon of Hope Shines through Housing Market Gloom" explores the true cost of owning a home based on combined monthly costs of ownership. 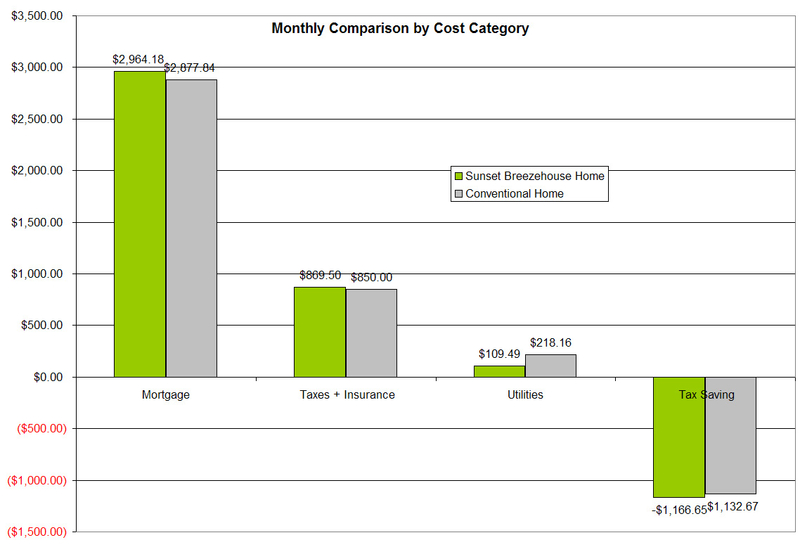 Compares monthly costs of owning a green home to a comparable conventional home, demonstrating the financial benefits of green home ownership. Redefining Cost: A Beacon of Hope Shines through Housing Market Gloom. Michelle Kaufmann, award-winning green architect and sustainable living expert, today announced the release of the white paper, "Redefining Cost: A Beacon of Hope Shines through Housing Market Gloom." According to the white paper, the current housing crisis provides an opportunity for growth in the green housing market. By fixing the flaws in the traditional way home costs are evaluated, which the author argues has contributed to the current dismal state of affairs, green homes reveal themselves as both financially and economically sustainable. The white paper, which is available for download at http://www.michellekaufmann.com, explores the true cost of owning a home based on combined monthly costs of ownership, including mortgage payments, utility bills, maintenance expenses, property taxes, and insurance premiums. 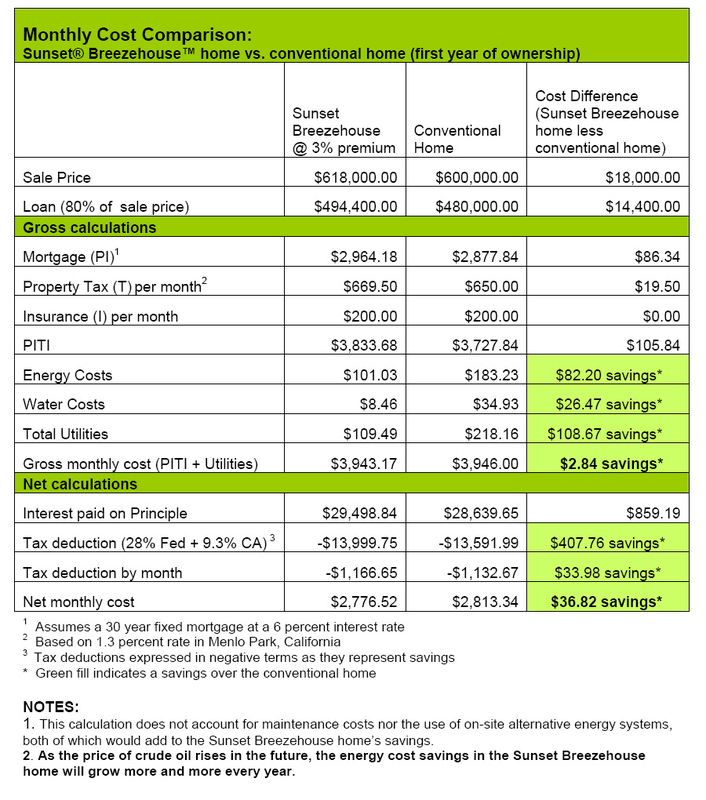 A monthly cost comparison between a green home and a comparable conventional home demonstrates the financial benefits of green home ownership--despite the premium attached to its sticker price. "In order to avoid repeating the dire situation so many home owners are in today, it is critical that our thinking evolve around home costs," said Michelle Kaufmann, founder and chairwoman of Michelle Kaufmann Companies. "Sticker price and mortgage payments are only one part of the equation. Once we start to equate monthly costs with the true costs of a home, the positive impact will reverberate among home owners who will be less likely to find themselves living in homes they cannot afford and more likely to choose green homes which are often more affordable in the long-term." 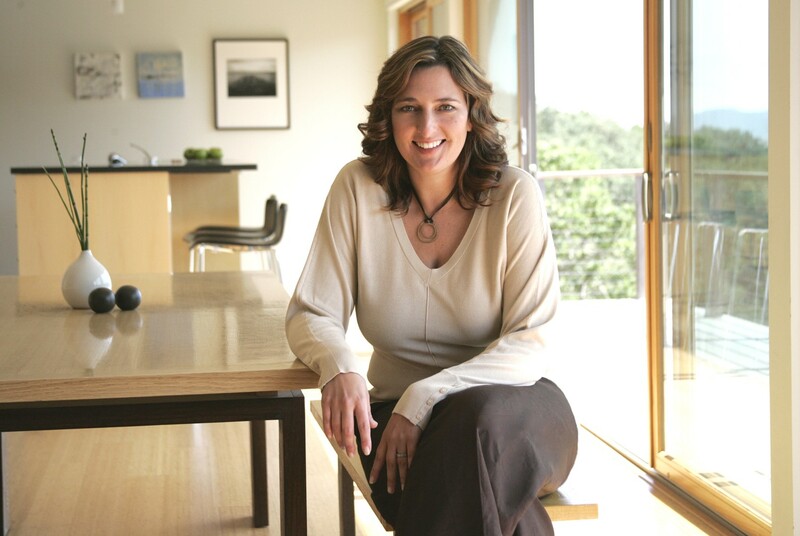 Michelle Kaufmann, who has built more homes for clients than any other firm in the modern modular architecture world, focuses on making beautiful, thoughtful design accessible to more people by employing prefabricated modular building practices and prepackaging green solutions. America's financial woes and how they are impacting the housing industry and Americans' ability to afford their homes. The negative impact of America's energy crisis on monthly expenses--from utility to transportation costs. Beyond cost per square foot: The many factors tied to the monthly cost of owning and operating a home, including property taxes, insurance premiums, utility bills, and the cost of maintenance. Why green homes are more affordable on a monthly basis. 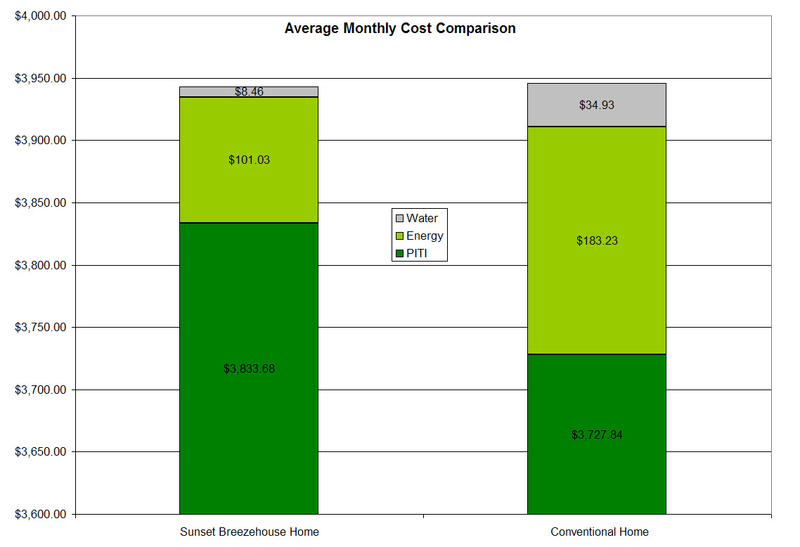 Cost comparison between green Sunset® Breezehouse™ and comparable conventional home. A comprehensive argument for the financial and ecological advantages of sustainably designed homes. "Because green home building embodies the principles of financial and environmental sustainability, today's chaotic state of affairs is just what is needed to catapult green homes into the mainstream market," added Michelle. "Judged on its monthly cost, a green home will likely prove the most economical purchase a homebuyer can make." By reducing resource consumption, waste, costs, and building time by up to 50%-75% over conventional building methods, Michelle Kaufmann's prefabricated, modular building techniques deliver benefits to individual homebuyers as well as builders/developers who are interested in building green multi-family and community developments. Michelle Kaufmann offers seven modular configurations--Glidehouse™, Sunset® BreezehouseTM, Sidebreeze™, mkLotusTM, mkLoftTM, mkSolaire™, and mkHearth™--as well as custom homes and larger multi-family and community developments. Michelle unveiled the first mkSolaire™ home as part of the original Museum of Science and Industry exhibit Smart Home: Green + Wired. The exhibit opened in Chicago May 8, 2008 and will run through January 4, 2009. Michelle Kaufmann (AIA, LEED® AP) is a tireless advocate and knowledgeable source for eco-conscious living. Michelle founded Michelle Kaufmann Companies with the mission to make it easier for people to build green and live a more sustainable lifestyle. To that end, Michelle Kaufmann leads a full service design/build architectural firm that uses off-site modular technology and prepackaged green solutions as the means to create beautiful, eco-friendly homes and multi-family developments. Founded in 2002 and headquartered in Oakland, CA, the company expanded to run its own factory delivering homes for clients on the West Coast. Michelle Kaufmann Companies also works with key factory partners to handle increasing volume and expanded territories. Interested in connecting with people beyond traditional architecture, Michelle has launched a collection of lifestyle media properties, products, and events designed to inspire individuals, families, and communities to create and enjoy sustainable lifestyles. She is renowned as one of America's leading green gurus. Visit Michelle's blog at http://www.blog.michellekaufmann.com. Learn more about Michelle by following her on Twitter @mkaufmann, or joining the Michelle Kaufmann group on Facebook.